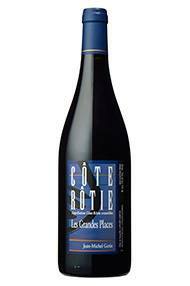 From the hillside above the winery in Verenay, Les Grandes Places is one of the great names of Côte Rôtie, its soils deeper and less stony than its neighbours, its wines among the longest-lived and most complex in the appellation. Aged in new wood for 18 months, but hardly showing it, this is an outstanding example of a poised and elegant vin de garde. Farming an outstanding plot of 10 hectares in Côte-Rôtie and another of a similar size (and quality) in Condrieu, Jean-Michel Gerin is one of the acknowledged masters of the region, imbuing Syrah with a wonderful purity and bringing out the full richness of Viognier. 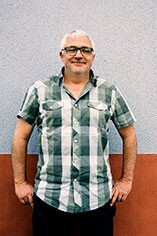 He is not only one of the great characters, but also one of the greatest winemakers in the Northern Rhône. Gerin's winemaking methods aim for fragrance and sumptuous texture, with the wines' substance based on fruit rather than tannic mass. He employs copious use of wood, yet his wines seem to integrate it in a remarkable way, a model for subtly oaked fruit purity. In addition to his appellation sites, he also makes excellent and well-priced Vins de Pays, and, to demonstrate both his passion and his pioneering spirit, he also has a vineyard in Priorat, a highly successful joint venture with Laurent Combier of Crozes-Hermitage.